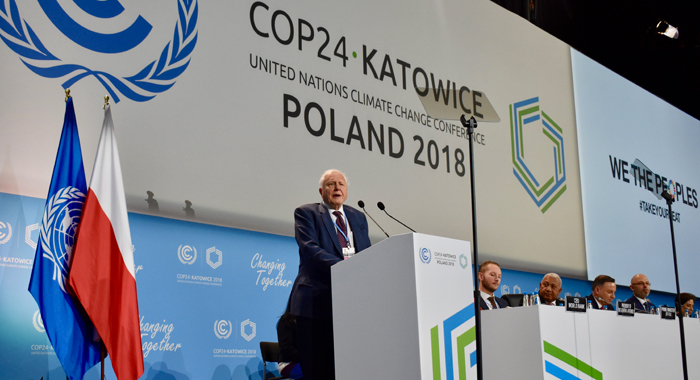 KATOWICE, Poland — The renowned broadcaster Sir David Attenborough has announced the United Nations’ launch of a new campaign enabling individuals the world over to unite in actions to battle climate change. “In the last two weeks,” he said, “the world’s people have taken part in creating this address, answering polls, creating videos and voicing their opinions. “They want you — the decision makers — to act now,” the British broadcaster said, addressing the politicians and officials assembled for two weeks in this Polish mining town to negotiate next steps in monitoring and mitigating climate change. The ActNow.bot is a fully interactive and responsive chat bot, located on the UN’s Facebook page that suggests everyday actions – determined by the user’s interaction with the bot — that can be taken to preserve the environment and logged on the platform to be shared with social media followers to persuade them to take action too. The collective actions will be presented during the United Nations Secretary-General’s Climate Summit in New York in September 2019. All the misinformation about Climate Change is very sad. Climate Change has been occuring since he beginning of time. The name has been changed from first “The Greenhouse Effect” to, “Global Warming” and now Climate Change. because the other names did not fit the facts. Global Climate is driven almost entirely by the sun, not humans, unless we start a nuclear war. One of the subjects I studied in the University was Climatology. I learned that CO2 was a vital life-giving element, essential to photosynthesis. Now they call it pollution, and purposefully try to make people confuse it with Carbon Monoxide (CO). The bankers and thier politician enablers are doing this to get your money. Look at France today. The people are protesting and destroying the country because of all the tax increases to fight “Climate Change”. The leader of France was a banker that worked for the bankers that are the biggest funders of Climate Change. Those same bankers own J.P. Morgan Chase Bank, that in turn owns Exxon/Mobile and other big polluters. The entire goal is to get more money and power. Countries like Saint Vincent will become even more poor than we are now if we all allow this to continue. If we think the “room tax” imposed by our government is bad, realize, things are just getting started. This is a big topic that deserves the reader’s research. See the film “The Great Global Warming Swindle” for starters.